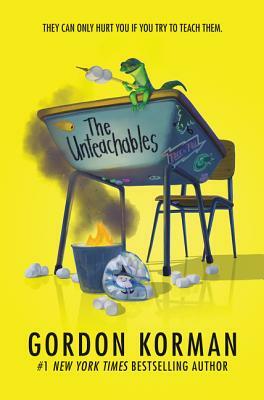 A hilarious new middle grade novel from beloved and bestselling author Gordon Korman about what happens when the worst class of kids in school is paired with the worst teacher—perfect for fans of Ms. Bixby’s Last Day. The Unteachables are a notorious class of misfits, delinquents, and academic train wrecks. Like Aldo, with anger management issues; Parker, who can’t read; Kiana, who doesn’t even belong in the class—or any class; and Elaine (rhymes with pain). The Unteachables have been removed from the student body and isolated in room 117. Their teacher is Mr. Zachary Kermit, the most burned-out teacher in all of Greenwich. He was once a rising star, but his career was shattered by a cheating scandal that still haunts him. After years of phoning it in, he is finally one year away from early retirement. But the superintendent has his own plans to torpedo that idea—and it involves assigning Mr. Kermit to the Unteachables. The Unteachables never thought they’d find a teacher who had a worse attitude than they did. And Mr. Kermit never thought he would actually care about teaching again. Over the course of a school year, though, room 117 will experience mayhem, destruction—and maybe even a shot at redemption. Gordon Korman published his first book at age fourteen and since then has written more than ninety middle grade and teen novels. Favorites include the New York Times bestselling Ungifted, Supergifted, The Unteachables, Pop, Schooled, and the Masterminds series. Gordon lives with his family on Long Island, New York. You can visit him online at www.gordonkorman.com.